Boruto Chapter 33 English translations are here and the Official Boruto Chapter 33 is going to be released in just a few days. You can read the official English chapter on Viz’s official website, MangaPlus website or their app when it’s released. A lot of different scans are out this time for Boruto Chapter 33 but let’s see the main panels which were translated by OrganicDinosaur before the official release. It pretty much covers everything. Boruto Chapter 33 is going to be so satisfying! You will love the ending. Let’s get started! Boruto Chapter 33 starts like this – We see Delta getting really angry as Kawaki did something really crazy. Delta is emphasizing on the fact that Kawak is just a vessel and that his body belongs to Kara and for Jigen’s sake only. This is the first time Jigen’s name has been revealed to Naruto and anyone outside Kara. Boruto Chapter 33 is getting interesting. Delta is like, “It’s impossible to regenerate by yourself so you have to come back to us anyway… Amado will heal you.” Naruto is getting riled up. He’s like, “Is Jigen your leader? How could he treat Kawaki like an object…” Delta is back with her trash talking but Naruto is going to get serious now. He roasted Delta pretty bad by saying, “Go on, try and kill me then… IF YOU CAN, THAT IS!! 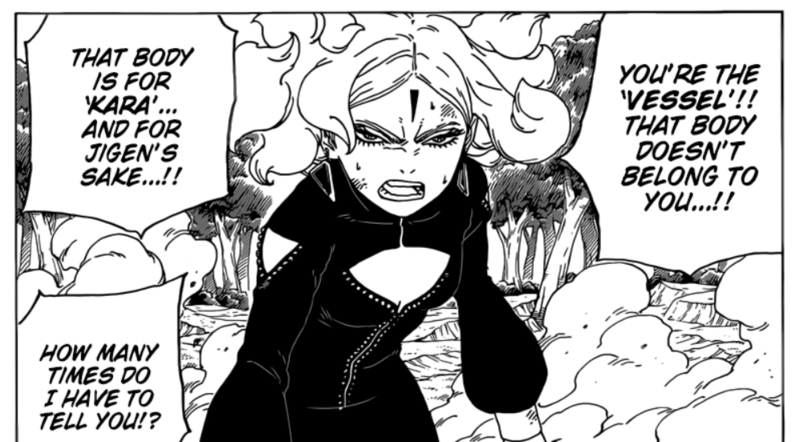 !” It’s getting hot in Boruto Chapter 33!